Dr. Sanjay Mehta is a prominent Indian educator. He received his Ph.D. from Maharaja Sayajirao University (M.S.U, Vadodara, for research in the field of “Principals’ Leadership Qualities.” He completed a Masters in English literature and also a Masters in Education Management. He is the Founder, Principal and CEO of several well-known schools, and serves on the advisory boards of many national and international organizations. He is the recipient a number of awards, including the “Jagadguru Shankaracharya H.H.Sri Jayendra Saraswati National Award” and the “Avantika Green Earth Award” for his contribution in the field of education. He is the author of a book on Educational Leadership as well as articles in professional publications. 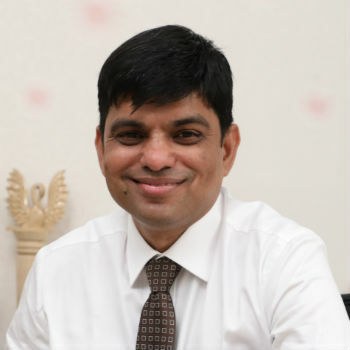 Dr. Mehta is the Founder and Trustee of the Countryside International School (CIS), in Surat and also serves as the CEO of the Shree Ramkrishna Knowledge Foundation (SRKKF). His consultancy company, Heuristic Education LLP, provides services to many organizations. Dr. Mehta is a keen researcher and was awarded “Best Paper Presenter” at the National Conference on Development and Sustainability. He is a student of English Literature and interested in a wide variety of fields—which has led him to develop his innovative and humane view of what leadership entails.